One of the great things about working in the slip-resistant matting industry is that we are able to supply some of the most prestigious courses in the country with our Golf Course Matting. That’s because our matting helps to improve the safety for both golfers while also improving the overall appearance of the course too. Recently, the folks at Cantigny Golf Club turned to PEM to help improve both the aesthetics and safety of its course. 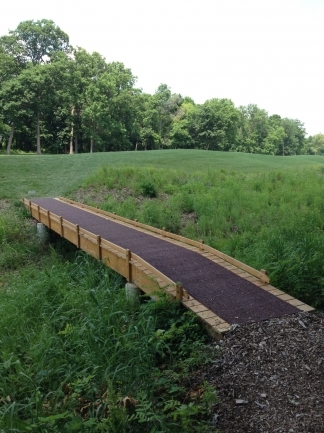 Specifically, they were looking to install some matting along its walk bridges around the golf course. Because these are areas that see constant foot traffic we recommended that they go with our High Traffic Matting. We specify the high traffic thickness for all golf course applications. In addition to its slip-resistance, our high traffic matting comes in a variety of colors, ensuring the perfect look is met for your application. 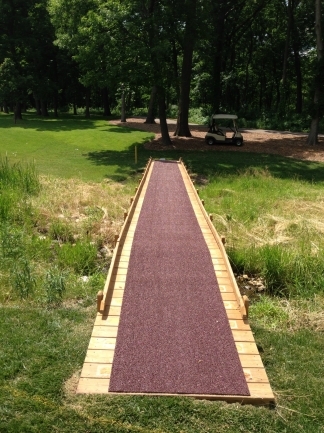 In this case, Cantigny decided to go with our Chocolate Brown High Traffic Matting. As you can see the brown tone blends well with the bridges. Our High Traffic Matting is also extremely durable. If properly maintained, it can hold up for several years, significantly reducing your yearly maintenance budget. If you have any questions regarding our High Traffic Matting, please feel free to email your questions to info@pemsurface.com or give us a call at 800-783-2358.